Recently I've been thinking about shampoo. As you may be aware I've recently switched to using colour protection shampoos because my hair is now red and as you may also be aware red is a very difficult colour to try and keep in your hair. Although I've been aware of sulphates in shampoo I've never really given them much thought. Sulphates (or sulfates outside of British English) are detergents that are added to products to produce a foam or lather to help remove dirt and oil. You'll find them in cleaning products but also in personal products such as hand soap, shower gel and the product I'm talking about here, shampoo. To check if a product contains sulphates you'll need to look out for Sodium Laureth Sulfate (SLS) or Sodium Lauryl Ether Sulfate (SLES) in the ingredients. Sulphates are a known irritant and although they effectively remove dirt and grease from your hair they can also be stripping, removing your hairs natural oils and causing it to be dry. I was using two different shampoos for coloured hair that I featured in this post. It was only after reading Jemma's post on a sulphate free shampoo that she was using that I thought to check the ingredients in my colour protection shampoos. When I did I found that there was SLS in both of the shampoos I was using and that it was the second ingredient after aqua (water). As sulphates strip hair of its natural oils this means they will also strip hair of artificial colour. It makes absolutely no sense to me how you can claim that a shampoo is colour protecting when the second highest volume ingredient in the product is one that by its very nature will strip colour. As I can't afford to keep up having my hair dyed in a salon (and also because neither of the two hairdressers I went to actually gave me the colour I wanted) I've taken to box dyes. Despite using a permanent dye the first time I dyed my hair myself it washed out completely in three weeks and I was back to my stripped colour. Admittedly I do tend to wash my hair every-other-day as it gets dirty/oily very easily, but washing out completely in three weeks is far from ideal. Despite my dislike of dry shampoo I've decided it's something I need to start embracing to try and help my hair colour last longer and I've also made the decision to go sulphate free when it comes to shampoo. It's all very well deciding to go sulphate free, but this really does narrow down your options. Not even considering standard shampoos I discovered that every single colour protect shampoo I checked in Tesco contained SLS. Going sulphate free means in general you're going to have to move towards high-end products and therefore obviously high-end prices. So far the only budget option I've found is L'Oreal Hair expertise Pure colour shampoo and even then this isn't that cheap at around £6. I'd been looking around for this after receiving a recommendation and happened to stumble on it half price in Wilkos. It's also currently on two for £9 in Boots, so there are offers around. When I first checked this one I found something called Sodium Lauryl Sulfoacetate (SLSA) in the ingredients and I did wonder if this was still a sulphate with a slightly different name. A quick Google search revealed that this is actually a 100% natural origin alternative to sulphates that is derived from coconut and palm oils. So this is one that's ok to find in colour protection shampoos. I have to say I'm really disappointed that high-end colour protection shampoos also contain sulphates as this is a really cheap ingredient. This effectively means some high-end brands are charging a lot of money for cheap ingredients that won't protect your colour despite the claim on the front of the bottle. 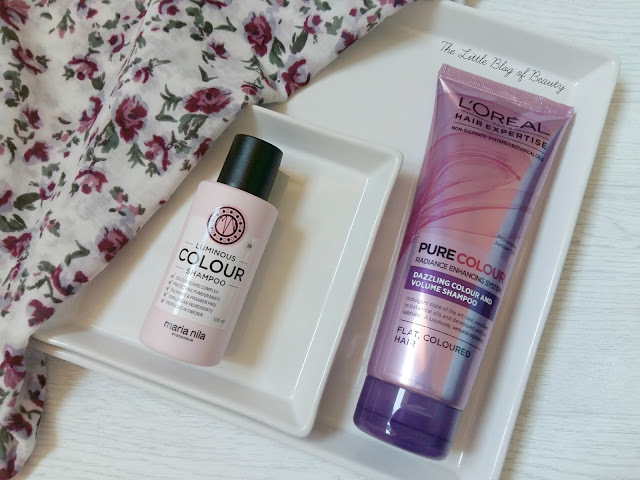 So far I've only found two high-end sulphate free colour protection shampoos, and one of these isn't very easy to get hold of, but I really haven't checked out many so far. The first is the Maria Nila Luminous colour shampoo (£14.99) which is currently only available in the UK from Sally stores and the Sally website. The other is the Paul Mitchell Ultimate colour repair shampoo (£7.75 - £39.25) which is more readily available. I have a travel size of the Maria Nila shampoo to try but don't currently have the Paul Mitchell one. As I come across more brands/products that offer sulphate free colour protection shampoos I will update this post. I also intend to try all of the ones I come across so I can review them, but you'll have to bear with me as this might take a while! Have you ever considered going sulphate free? I love Maria Nila! Their products always smell so good and actually give you such good results! Interesting read.